No one wants their child to experience the torment of bullying. If they do encounter this behavior, are they prepared to handle the situation? Knowing how to cope with bullying is a much needed life skill our children must learn to successfully navigate conflict. 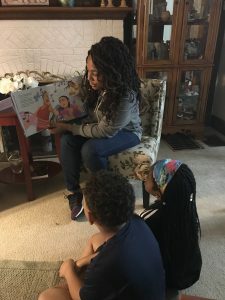 The Little Girl with the Big Voice, written by Wė (pronounced Way) McDonald, is a book your child can relate to and may be helpful in starting conversations regarding bullying. The book teaches valuable lessons such as how to overcome adversity, and building self confidence. Written in Wė’s own words, the book is a powerful story about a girl who courageously embraces her uniqueness and finds her voice. The kids are little older now and the novelty of going to school has wane. I have always shared with my nieces and nephews that they should not take education for granted … that going to school should not be a chore as there are many children in this world who would love the opportunity to learn how to read, write, and fuel their imaginations. However, they are unable to attend school because they cannot afford clothing, supplies, and books. 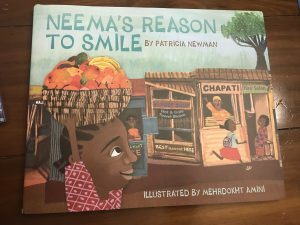 Neema’s Reason to Smile, written by Patricia Newman, is a vibrant and lyrical tale of a young Kenyan girl, named Neema, who dreams of going to school. We learn about Neema’s young life and how she must work selling fruit instead of receiving an education. 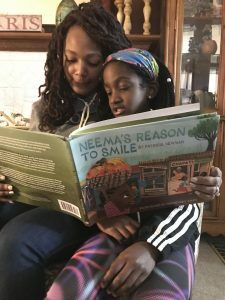 She saves her coins in hopes of one day having enough money to pay for school, but it is one step forward two steps back for young Neema. One day Neema spots a little girl heading to school and follows her. She ends up at a school and witnesses a learning environment she had only dreamed of. School was everything she thought it would, but alas, it was not meant to be for Neema; so she thought. For young readers, I believe this book is about responsibility to family, kindness and reciprocity. Although this story is considered fiction, the story is based on the real-life students at Jambo Jipy School in Kenya. Ellie loves to build. She’s always engineering new creations with the help of her imagination and her best friend Kit. Unfortunately, with Kit’s birthday just around the corner, the French-braiding machine Ellie built turns out to be more of a hair-knotting machine. What’sEllie going to do? Luckily, the girls overhear Kit’s mom talking about Kit’s surprise – it must be the dog she’s always wanted! Ellie is struck with inspiration: she’ll build Kit the best doghouse ever! The project quickly becomes more than just a present for Kit – it builds a bridge between Ellie and those bothersome neighbor boys, as well as the other handy girls in her class. 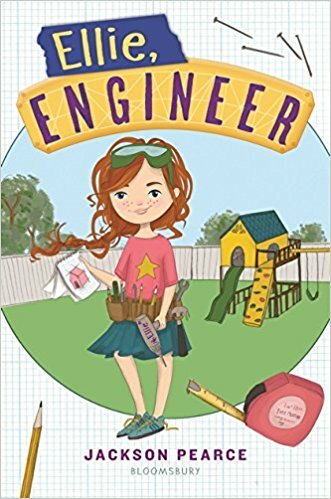 Designed to look like Ellie’s notepad, with pencil-on-graph-paper illustrations of her projects interspersed throughout the book, Ellie,Engineer inspires creative and crafty girls to get hands-on with their imagination. Ellie’s projects range from the simple (using a glass against a wall to amplify sounds), to the practical (the doghouse), to the fantastical (a bedroom security system featuring spikes) – encouraging readers to start small but think big. Ellie’s parents support her engineering experiments, with important safety tips sprinkled throughout, and her relationship with Kit is a glowing example of positive female friendship. They share their hobbies – Ellielikes to get her hands dirty, while Kit prefers ballet – reminding readers that there’s no wrong way to be a girl. Ellie’s hand-drawn tool guide at the end explains basic tools in accessible terms, rounding out this fun and funny adventure, and giving girls everything they need to be their own Ellie! LEGO bricks have been used for decades by children and adults to create dazzling and playful buildings, vehicles, and unique works of art. In The Greatest Brick Builds: Amazing Creations in LEGO ( available in hardcover $19.99), these jaw-dropping creations are presented in full color, with close-up photos, scale representations, historical commentary on the structures, and details on how each model was constructed using LEGO bricks. Included in this collection are the Golden Gate, the USS Missouri, and the Great Sphinx of Giza, as well as other iconic structures created by LEGO crafters from around the world. 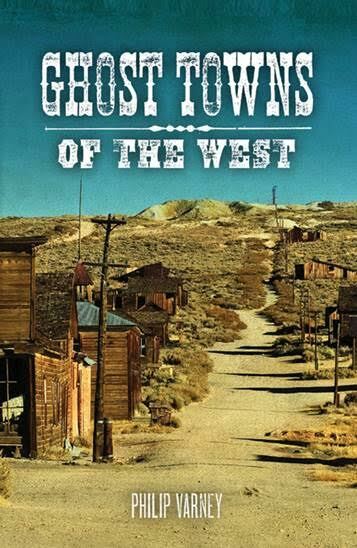 Ghost Towns of the West by Phillip Varney and Jim Hinckley blazes a trail through the dusty crossroads and mossy cemeteries of the American West, including one-time boomtowns in Arizona, California, Colorado, Idaho, Montana, Nevada, New Mexico, Oregon, Utah, Washington, and Wyoming. The book reveals the little-known stories of soldiers, American Indians, settlers, farmers, and miners. This essential guidebook to the historic remains of centuries’ past includes maps, town histories, color and historical photographs, and detailed directions to these out-of-the-way outdoor museums of the West. Plan your road trips by chapter–each section covers a geographic area and town entries are arranged by location to make this the most user-friendly book on ghost towns west of the Mississippi. Does Adventure Call Your Name? We hope so! If adventure does call your name, pull up a horse for a wild ride with Misfortune Annie—the fastest draw in the 1880s west—at age 15! What’s compelling to us is that a hero like Misfortune Annie truly could have existed. The real Annie Oakley fought amongst the toughest of wranglers and bested many a man in shooting contests. In fact, while still a teen, Annie Oakley earned enough money to pay off the mortgage on her mother’s farm. To properly tell the origin of our Annie, we should travel back to the initial spark—George Lucas and the Indiana Jones series. It’s widely known by many Lucas fans that a rugged archaeologist character first showed up in old matinee serials, and George dusted him off for a new generation of movie lovers. When hoping to develop a story concept and character that could give Indy a run for his money, we found ourselves pondering the cowboy genre. Roy Rogers, the Lone Ranger, Gene Autry—they were huge! Perhaps our new star should have a catchy name and signature duds. He would wear a ten-gallon hat and Levi jacket. But fate threw in a wildcard. On Christmas vacation several years ago, nearly asleep behind the wheel through flat old Kansas, Dave passed a sign that boasted, “Annie Oakley Museum.” Jolted awake, he realized he had our new hero, a tough and tenacious teen, a cowgirl known by a memorable moniker. Not only could we hopefully create a memorable hero, one to delight the young and the young at heart, we intended to focus on a somewhat lacking niche in middle-grade/YA fiction—an action hero for girls. As storyboarding for the first book progressed, we carefully considered our villain. The era of the Wild West merges well with and complements Steampunk, so our villain evolved into a mad scientist, a mechanical engineer bent on revenge. 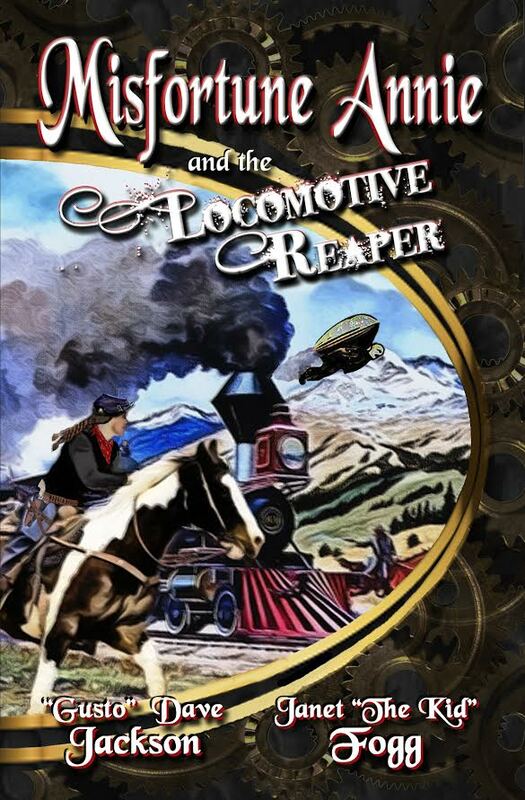 Research into the technology of the 1880s—blimps and electricity—sealed the Locomotive Reaper’s powers. A look at the authors who wrote the book Sci -Fi Junior High- you can also enter to win a copy HERE. 1. 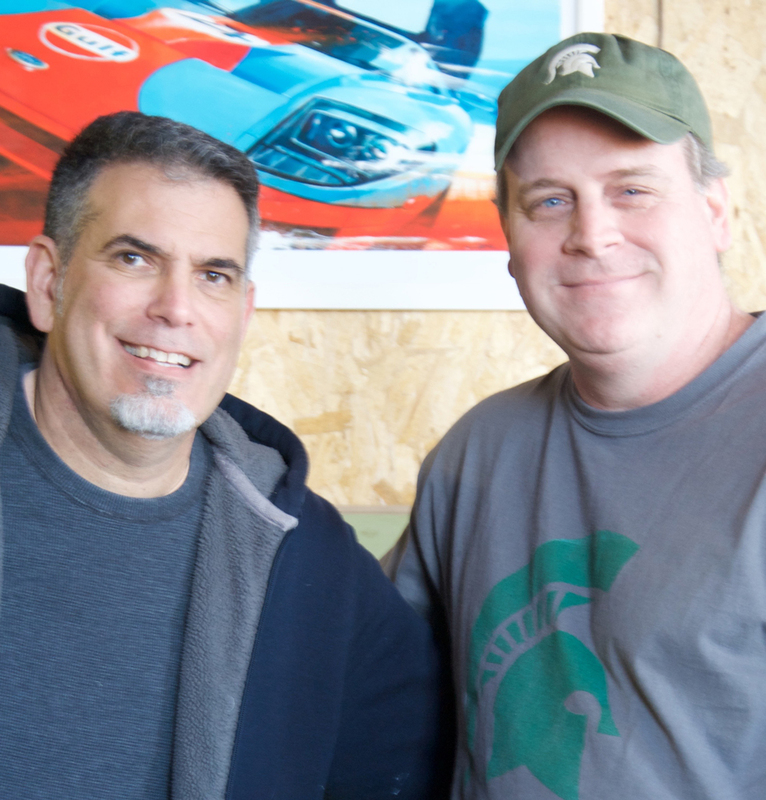 Collaboration between two artists, especially a successful one, is a rare partnership. How did the two of you meet? What inspired you to collaborate? Scott: We met the same way all great literary duos throughout history have—through our daughters playing travel softball together. When I discovered that John had all the same childhood influences I did, and could actually draw, working together on children’s books seemed like a no-brainer. Which is perfect for us. 2. What is the inspiration behind Kelvin and SCI-FI JUNIOR HIGH? Did one or both of you always dream of going to school in outer space? John: I had no dream of going to school in outer space. However, when I was a kid, I created a comic strip of a martian borrowing sugar from his astronaut neighbor in space. Scott and I wanted to collaborate with a middle school concept. For SCI-FI JUNIOR HIGH, I suggested the story title and a basic premise that involved many types of creature students. Then Scott went to town developing the story alongside some of my character sketches. I do believe that our inspiration for Kelvin and his family is based slightly on the Robinson family in Lost in Space. Throw a bit of Charlie Brown and Looney Tunes into the mix, and voilà: SCI-FI JUNIOR HIGH. Scott: We like creating stories filled with as many bizarre creatures, strange locations, wacky gizmos, and oddball characters as possible, because that’s what we couldn’t get enough of when we were kids. Our first book series, VORDAK THE INCOMPREHENSIBLE, dealt with the superhero/supervillain world, which fit the bill perfectly. SCI-FI JUNIOR HIGH takes that up another notch, what with the entire universe and its contents at our disposal. 3. What are your writing and drawing routines like? Do you work together, separately, or a combination of both? John will work on character concepts and creating the feel of the world. Sometimes, I’ll have a specific look for a character or device in mind and John will sketch it up. Other times he’ll show me some crazy thing he came up with and I’ll work it into the story. It’s a pretty loose system. There was one character I particularly liked—a bunny wearing goggles and a jetpack. We turned him into a plushy and made him the book’s villain. John: Scott has named most of the characters, with a few exceptions, such as our main villain, Erik Failenheimer, who is based on a suggestion of mine. I changed our bully’s character design look based on Scott’s name. We even have a few co-named characters in the book. 4. What do you hope children will take away from this story? Scott: Two things: first, don’t worry about trying to impress everybody. It’s okay to just be yourself. People (or, in this case, six-eyed aliens and giant talking slugs) will still like you—at least the ones worth having as friends. 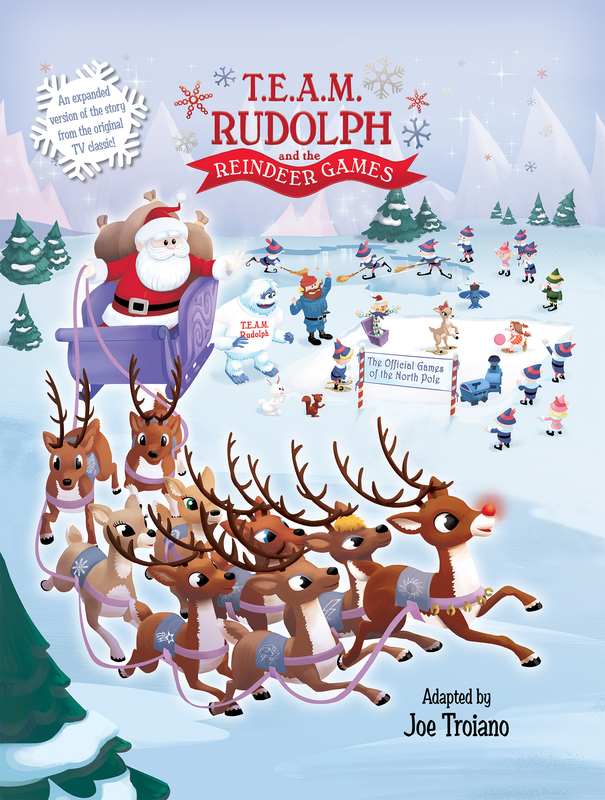 Secondly, we hope kids just have a blast reading it. We try our best to have something exciting or ridiculous or weird to read or look at on pretty much every page. We want even the most reluctant reader to keep turning the page to see what absurdness comes next. John: We also feel that James Patterson is a perfect partner for us. He is “dedicated to making kids readers for life.” Hopefully this crazy-zany story will be a big part in making that happen!